I was searching recently for any connections between Ralph Vaughan Williams (1872–1958) and Staffordshire. The composer’s maternal grandmother, Caroline Sarah Darwin, was the eldest sister of Charles Darwin, and so she was a grand-daughter of Erasmus Darwin of Lichfield, as well as being descended from the Wedgwood family. However, I had yet to find a folk tune from Staffordshire collected by Vaughan William and used as a tune for a hymn in the English Hymnal edited by Vaughan Williams and Percy Dearmer. But in my quest I came across an old folk song known as The Squire of Tamworth, also known as The Tanner of Tamworth, The Golden Glove and Dog and Gun, which was collected by Vaughan Williams in 1904. However, the suggestion that this song tells the story of an incident in Elizabethan times is made in Dixon’s Songs of the Peasantry (1846). It has been published in broadside form since the early 18th century, but is much, much older. There is evidence that it was known to traditional singers for at least 250 years. Timothy Connor, a prisoner of war in England during the American War of Independence, included this song in a songbook he compiled while he was a prisoner in 1777-1779. Since then, the song has been printed by many broadside printers, and has been widely collected in both England and America. It appears in Dixon’s Ancient Poems Ballads and Songs in 1846. There are 234 records of Golden Glove in the Vaughan Williams Memorial Library, collected all over England by collectors including Frank Kidson, Mike Yates, and Cecil Sharp. It was collected by Sabine Baring-Gould in Devon in 1893, by Vaughan Williams in Ingrave, near Brentwood in Essex in 1904, and by Clive Carey in Treyford, Sussex, in 1912. In late 1903, a year before he found this tune in Ingrave, Vaughan Williams discovered the folk song Bushes and Briars at Ingrave. The impact of that discovery was profound and permanent, influencing the texture, contours and melodies of his work as editor of the English Hymnal from 1904 on and on his other work. His orchestral works written shortly after hearing Bushes and Briars – In the Fen Country and the Norfolk Rhapsodies, for example — are wonderfully atmospheric. When Charles Potiphar sang Bushes and Briars to the composer at Ingrave on 4th December, 1903, the soul of Vaughan Williams was charged with the energy of England's musical past. This, of course, was Vaughan Williams's legendary 'moment of epiphany' and he went on to collect some 810 songs over the next 10 years or so. But I am surprised that the tune of The Squire of Tamworth, The Golden Glove or Dog and Gun was not adapted for any hymn settings. The folksong continued to be sung not only in Staffordshire but throughout England in the 20th century. In 1973, Muckram Wakes sang The Squire of Tamworth on their first album, A Map of Derbyshire. Later, Frank Hinchliffe sang The Golden Glove in 1976 at home in a recording by Mike Yates and Ruairidh and Alvina Greig. This was published in 1977 on his Topic LP In Sheffield Park: Traditional Songs from South Yorkshire. Nic Jones recorded The Golden Glove for his 1977 album The Noah’s Ark Trap. He also played fiddle on the same track on Chris Foster’s album Layers from the same year. John Wesley Harding sang the ballad on his Nic Jones tribute album, Trad Arr Jones. A live recording by Shirley Collins in 1981 is included in her four CD anthology Within Sound. A year later, Sally Barker sang The Golden Glove on her CD Tango! (1992). In March 1997, Fairport Convention played The Golden Glove with Sally Barker’s tune live at Canterbury Marlowe Theatre. This recording was included a year later on their CD Who Knows Where the Time Goes. Ruth Notman learned The Squire of Tamworth from a Will Noble CD and recorded it in 2009 for her second CD, The Life of Lilly. Jim Moray recorded The Golden Glove for his CD Skulk in 2012, when Hannah James and Sam Sweeney also sang the song on their second duo album, State and Ancientry. Hannah James said then she heard this song being sung by Cuthbert Noble at the Shepley Folk Festival, and linked the song back to Vaughan Williams. And he courted a nobleman’s daughter so fair. And the friends and relations they’d given their consent. Oh, her heart was inflamed and bitterly she did cry. But instead of getting married she took to her bed. A way for to have him she quickly did find. And away she went a-hunting with her dog and her gun. Because in her heart, oh, she loved him right well. And with her dog and her gun then to meet him she went. “Oh no,” said the farmer, “I’ll take a sword in my hand. As she went out a-hunting with her dog and her gun. And with a heart full of love to the lady he goes. And I hope that you’ll be pleased for to grant me some love. For I love the sweet breath of the farmer,” she cried. How she’d gone out a-hunting with her dog and her gun. 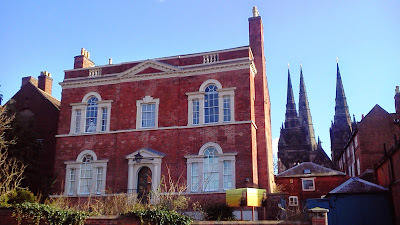 If the song does not date back to Elizabethan times, then there is no point in speculating about who the Squire of Tamworth was and dreaming about any connections with the Comberford family of the Moat House. However, I am still in search of any evidence of Vaughan Williams returning to see Erasmus Darwin’s house in the Cathedral Close, and any evidence of his use of Staffordshire folk tunes as settings for hymns.